Sustainable Synthetic Green Spaces in Southern California When it comes to your household, our master craftsmen will seamlessly braid together naturalistic luxury and your personal aesthetic to create a perfect home sanctuary. Capitalizing on dramatic focal points and organic design, we can build the recreational space of which you’ve always dreamed. In addition to serenity, beauty, and charm, you’ll notice substantial savings when it comes to caring for your home, too. Why? Well, it’s no secret tight water restrictions in Southern California (and beyond) have become a common reality given the increasingly harsh summers. Among the most worthwhile and eco-friendly compliances with these restrictions is the installment of an alluring artificial lawn. In fact, countless homeowners with perfectly crafted synthetic lawns qualify for generous rebates and bonuses that often deliver profitable returns on their investment. In many cases, you’ll recoup your investment on your designer lawn (including installation) within the first few years. And you’ll be conserving water — a major contribution to the environment. 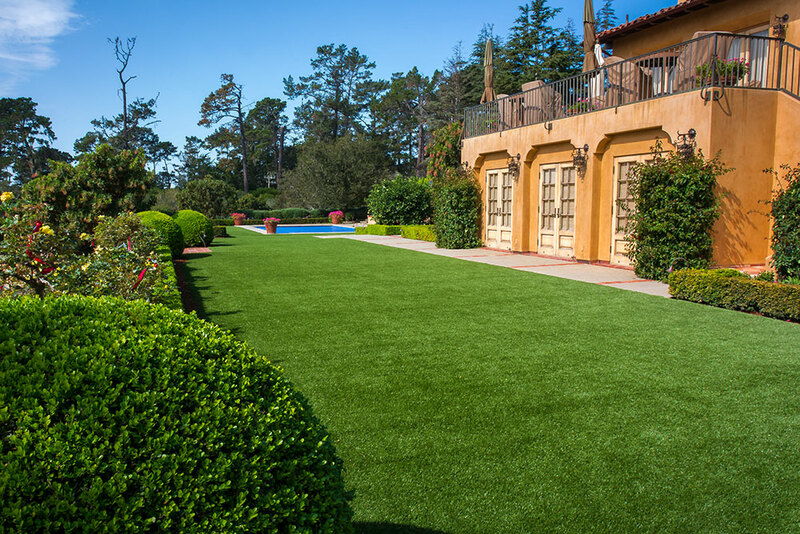 Not only will your artificial turf elevate the appearance of your home, but synthetic grass is virtually maintenance-free, requires no watering or mowing, and adds a vibrant and lush look to your home year-round. Furthermore, you can stop wasting cash on insecticides, weed killers, or other harsh chemicals. Not to mention, Back Nine Greens installations are 100% lead-free, which ensures the safety of your children and pets, as well as the environment. When you pull up to your home, what do you want to see? A springy, lush, verdant lawn means you have pride in your home and invites others to enjoy your home’s elegant curb appeal. Whether you’re looking for a welcoming place to kick off your shoes and picnic under the stars or a spot to let your kids run around with the dog, your outdoor life will be made so much easier and more beautiful by a neatly-trimmed green lawn. We install only the highest-grade, truest-to-life, most durable artificial grass. And our lawns are like nothing you’ve seen — or felt — before. That’s because they look matte, feel silky, and spring back like authentic grass. Your guests will marvel at the streamlined beauty of your perfect outdoor oasis. If you’ve got a pet, you know how easy it is for them to destroy a beautiful natural lawn or garden. But, with Back Nine Greens, you eliminate the possibility that Fido might destroy your yard. When our master craftsmen install your new synthetic green for dog runs and play areas, cleaning up after your pet becomes a breeze. Simply pick up and remove any solid waste from your lawn — that’s it. You won’t need to rinse your lawn because the ZeoLite in our pet installations erases the need to clean your lawn. Zeolite is a safe and effective way to detoxify pet environments. And since you won’t have to wash down your lawn, you’ll conserve even more water. Furthermore, pet urine will simply absorb into the sand beneath your turf and evaporate. 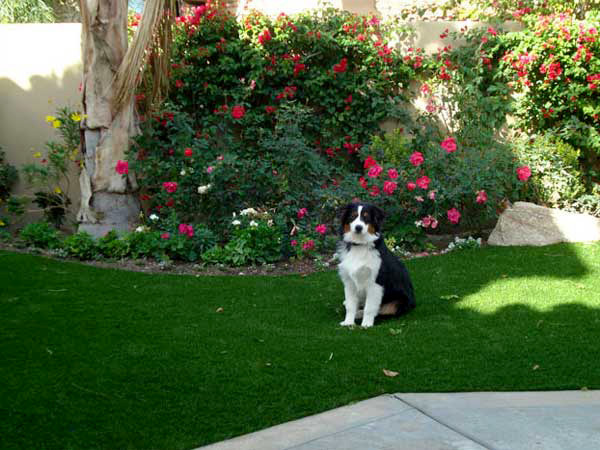 ZeoLite is the industry’s leading artificial grass infill for pet odor control. In fact, Zeolite is guaranteed to stamp out pet odor and help control any type of unpleasant scent. The view from your deck could be an unforgettable panoramic sunset or a dramatic ocean scene. Regardless of what you see from your home, we’ll turn your roof, deck, and patio into works of art with our beautiful synthetic green flooring. Invite your neighbors up to the roof for an evening putting match… or bring your living space outside to entertain on a naturally inviting synthetic lawn. We’ll convert your outdoor space into the perfect retreat — one that boasts an incredible deck or rooftop entertainment center and lets you reinvent home relaxation. Sip wine, serve dinner, relax by the spa, or enjoy your pristine rooftop garden — an elegant synthetic lawn will give your home the variegated look and feel of the most exclusive high-end club or hotel. Your home will become a place for an anytime staycation. All you’ll need to do is step outside. Beyond atmospheric enhancement, one of the most significant benefits of installing artificial turf on your deck or rooftop is fire protection. In recent years, wildfires have tragically burned close to 9 million acres of land in California. But you can help protect your home and outdoor spaces with Back Nine Greens. Here’s how: the same fibers and backing that give our synthetic turf its shock-absorbent plush feel are fire-resistant. So, in the unfortunate event of a fire, these top-grade materials can help defend the areas of your home below our artificial grass from potential damage. 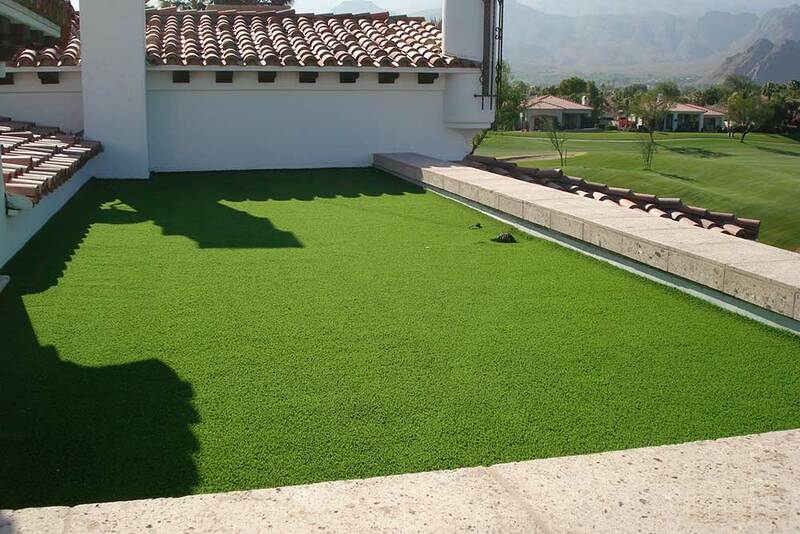 Furthermore, every single Back Nine Greens installation meets California code for outdoor living and is guaranteed against fraying from frequent use or certain harsh weather elements. On the green, it’s you against the earth. No matter how many times you return to conquer your favorite hole, the elements conspire to challenge and delight you. But you can bring your love of the game home by installing a personally tailored putting green. Not only will you beautify your home by adding a playful component to your exquisite landscape, but our master craftsmen will expertly design and install an impeccable, eco-friendly, low-maintenance, and stunning year-round green so you can practice your short game in the comfort of your own home. Our artisan designers promise to give you exactly what you’re looking for in a putting green: a firm, true green that will drain perfectly. We’ll conduct a detailed interview to learn everything we can about your playing style, skill level, and set of personal preferences. And we’ll set out to customize your green to suit your desired green speed, fringe, and rough cuts. For the truly passionate golfer, there’s nothing like a superior green on which you can hone your short game. Personally crafted by the melding of your imagination and our experience, Back Nine Greens synthetic putting areas are skillfully built from concept to completion. 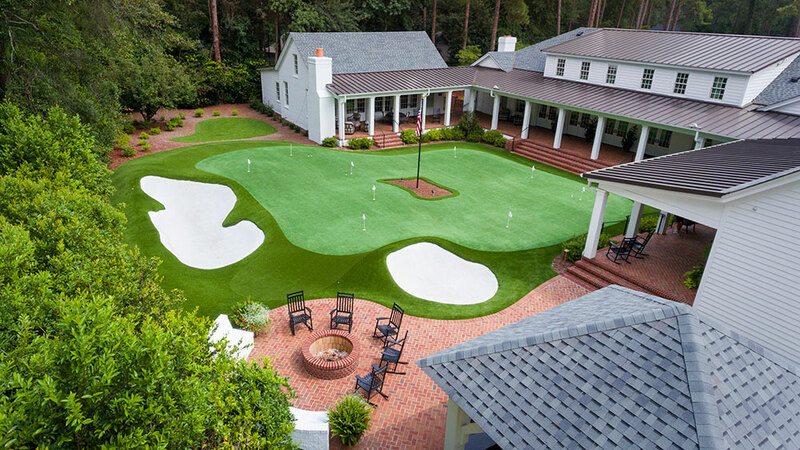 Pride, artistry, and earned expertise allow us to invent a personal putting green for you that blends seamlessly with the natural elements of your home’s landscape. We guarantee our synthetic putting greens will add lasting style to your home and increased value to your property. When it comes to conservation, your synthetic landscape will be entirely low-maintenance. You can significantly conserve water (and spending). There will be absolutely no watering or seeding – ever! Also, given Back Nine Greens’ state-of-the-art manufacturing techniques, your installation will be a striking enhancement to your property that will last year-after-year. Not to mention you’ll be enjoying a lead-free green, so you can rest assured that your family is safe. No matter your level of play, inspiring your game is our goal, first and foremost. That’s why we’ve partnered with PGA and Champions Tour golfers Dave Stockton and Dave Stockton Jr. to craft a superior product for every player. Both are highly-regarded in the golf industry and both have lent their expertise, passion, and game savvy to our pursuit of home greens that look, feel, and play like the most exceptional golf greens on the professional circuit. Why limit practicing your short game to the outdoors? At Back Nine Greens, we’re also known for our eye-catching interior greens. Again, no matter the shapes or size of the room, our ambitious master craftsmen will design a fully customized putting green or play area inside. So, play until your heart’s content — in any weather at any time of day.